Afghan Leader Invites Pakistan’s PM for State-to-State Talks - Integration Through Media ....! (VOA): President Ashraf Ghani of Afghanistan has formally invited Pakistan’s Prime Minister Shahid Khaqan Abbasi to visit Kabul for initiating a “comprehensive” dialogue to improve bilateral relations, marred by mistrust and suspicion. Ghani extended the invitation Saturday in a meeting at his presidential palace with visiting Pakistani National Security Adviser Nasser Janjua, as announced by his office on Twitter. The Afghan president last month offered unconditional peace talks to the Taliban and also pledged to resume Kabul’s high-level engagements with Islamabad to repair bilateral security, political and economic cooperation. Ghani made the twin announcement in a speech during the so-called Kabul Process meeting of more than 25 countries and international organizations. The Taliban has not yet publicly responded to the offer, however, prompting expectations the insurgents are weighing whether or not to come to the negotiating table, Pakistan and U.S. officials said. 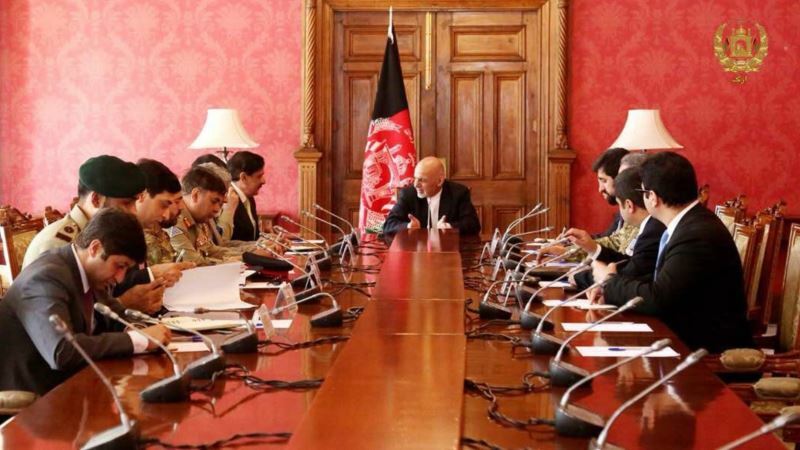 A presidential statement issued after Saturday’s talks said the two sides also discussed ways to enhance cooperation to further Ghani’s peace dialogue offer to the Taliban. In addition, the statement said views were exchanged on how to jointly counter cross-border activities of terrorist and criminal networks, as well as drug traffickers. Afghanistan shares a nearly 2,600-kilometer largely porous border with Pakistan. Allegations that Pakistan covertly supports Taliban insurgents and allows them to maintain sanctuaries in the neighboring country have long been at the center of mutual tensions and strained ties. Islamabad rejects the charges. Janjua in a pre-visit statement had said his delegation was traveling to Afghanistan to “chalk out a way forward” to improve mutual ties and enhance cooperation to further Ghani’s offer of peace talks to the Taliban. “Pakistan is always prepared to work in a cooperative framework and provide every help to win peace in Afghanistan,” Janjua said in his pre-visit statement late Friday. Pakistani military chief General Qamar Javed Bajwa recently spoke to a group of journalists and sounded upbeat about better future relations with Afghanistan. Bajwa, in a rare interaction, credited his meeting with Ghani in Kabul last October for providing grounds for the breakthrough. The Pakistani general has said since then “the vibes are positive” and he has been in regular contact with the Afghan president via cellphone to sustain the momentum of promoting a peaceful settlement to the Afghan ward tension-free bilateral relations. Tensions in relations between Afghanistan and Pakistan over mutual allegations of supporting terrorism against each other have undermined trade and economic cooperation in recent years. Better ties between Kabul and Islamabad are seen as key to fighting terrorism and promoting a peaceful resolution of the Afghan conflict.